New Workshop – Get Carded! 9:00 a.m. to 12:30 p.m. or 1:30 p.m. to 5:00 p.m.
Join me for a morning or afternoon (or both!) 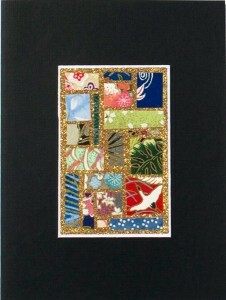 of Chiyogami/Washi Paper mosaic card making. The studio will be setup just like the full Mosaic workshop, and includes iced tea and light snacks. 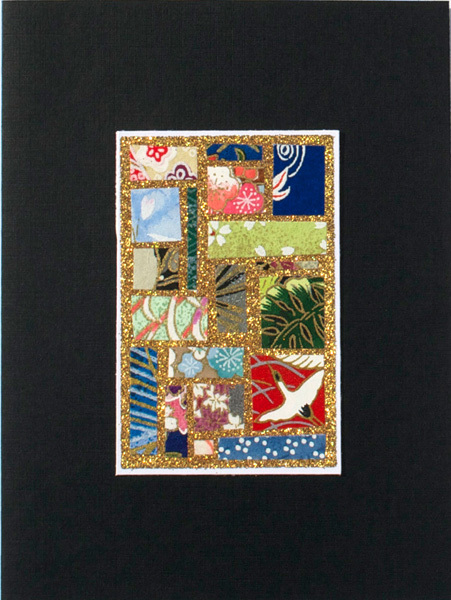 The course fee includes all the materials needed to make as many 2”x3” mosaics as you can during the session, plus the cardstock, liner paper and envelopes to complete the cards. This size is perfect for cards or group wall hangings, and it is the same size as the ones you did at your first workshop. Spraying will occur every ½ hour, with the last spraying occurring ½ hour before the end of the session. As with the original workshop, you can finish your cards, tidy up your work area or shop while you are waiting for the last of your mosaics to be sprayed and aired out. Separate morning and afternoon sessions will be held. Join me for both and a complimentary salad bar lunch is included. Call (707) 546-4550 to register.